These are going to make my friends so happy! Instead of picking up plates, napkins and candles, I chose gadgets that would keep on giving. Recently, we had an accident with our food processor, so this sleek red manual food processor caught my eye. This way, I get a work out with my cooking! All the veggies for salsa and salad are getting the treatment in this beauty. This year my Christmas dinner is all Mexican themed, with fresh tamales, empanadas and salsa. Topped off with Frangelico cake. Yum! And you have to have a good breakfast, right? 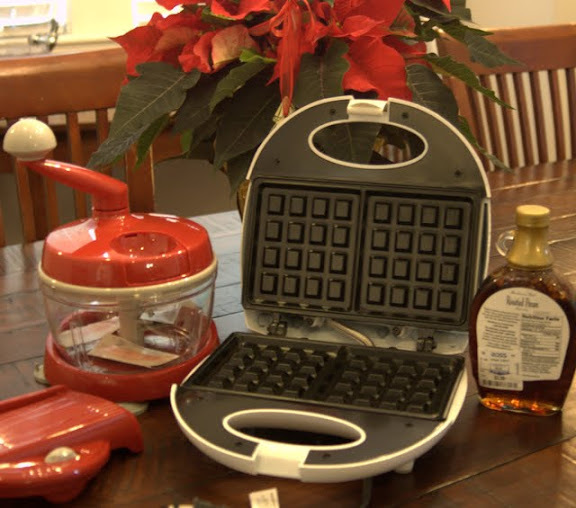 So this waffle maker was just the thing. Pecan syrup picked up for a song at Ross will take them to the next level. Double Yum. I have to admit that I went beyond the gift card. A scrumptious red dress was calling my name and I had to have that cobalt blue sweater to wear to the party on Friday night, didn’t I? But at prices like these, I didn’t feel the least bit guilty. Not one bit. Ross sent me their party and entertaining tips. Seems like we are of the same mind. Take a look! Toast the holidays and don't stress out your bank account. 1. Plan early, execute flawlessly! Ross stores start carrying holiday-themed items earlier in the year than most department stores, in line with our “early bird gets the deal” motto. Make a list of things you’ll likely need this season (decorations, new serving plates, potpourri, gift bags, etc. ), and shop now, to avoid the crowds and get the best items. 2. Tight on space? It can be difficult to host a party when you live in an apartment or small home. But if you invite guests to a “Holiday Open House” spanning 3-4 hours, you can have them all come and go without too much crowding. 3. 50-cent hors d’hoeuvres: Stop fretting about the food and check out Chow’s list of affordable and impressive “small bite” recipes that end up costing about 50 cents per piece and tasting like a million bucks. 4. Share the burden: Have handy a short list of items or dishes that you’d like to see your guests bring along. That way, when people ask you can actually take them up on the offer! There’s no need to go at this alone. 5. House Cocktails: To save money on the liquor/beer/wine, choose or invent a cocktail of your own and make it your seasonal signature. Let your guests know that you will be serving that cocktail, but they should feel free to bring their own drinks of choice if they have other preferences. 6. Speaking of cooking: If your kitchen equipment is in need of an upgrade, the last thing you want to do during the holiday season is buy expensive pots and pans. Ross carries an impressive selection of cookware, as well as serving dishes. 7. Hostess gifts a-plenty: If you ruled out entertaining this season and are party-hopping instead, make sure to pick up a few hostess gifts next time you’re at Ross. We’re carrying gift baskets and we have a great selection of candles, seasonal decorations and even candy and the wrapping paper and gift bags to carry them in. 8. Natural décor: After Thanksgiving, when bags of cranberries go on sale for $1, buy a few, and pour them into bowls to hold pillar or votive candles. Your local Ross store is a great source of inexpensive, roomy glass bowls and vases. You can also throw them in a glass of water and put a floating candle in. 9. Wrapping paper centerpieces: Use a square of stiff, colorful seasonal wrapping paper, and roll it into a cone. Glue together and add glitter, paint or sequins and use them as centerpieces, surrounded by greens. You can find tons of colorful, affordable wrapping paper rolls at Ross. 10. Bake your own: Making salt dough ornaments with the kids is a great way to keep them entertained while the adults are sipping cocktails. Mix flour, salt, water and a little oil, create the shapes and then bake them. When the cool off they’re easy to decorate with paint, glitter, buttons, beads, and anything else you can think of. Would you like to share your tips here? I would love to hear them!